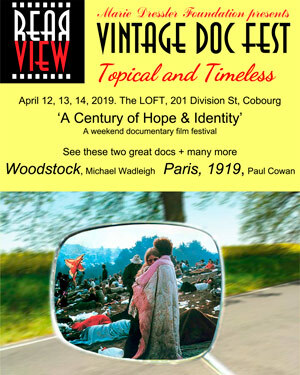 Doc Fest poster - click to enlargeYes, you read it right, ReaRView in 2019 will add a Friday 7pm screening to the two-hour time slots on Saturday and Sunday. And yes, the Saturday and Sunday morning time slots are free as before. Can you still buy a full weekend pass to guarantee you one of the 60 seats in Cobourg’s The Loft? Of course you can. Like the 2017 and 2018 ReaRView DocFests, the program will follow a theme. In 2019 the theme will be ‘A Century of Hope and Identity’. There’ll be films reaching back to 1919 exploring the last century in terms of hopes fulfilled or dashed over 100 years and the issues of identity that emerged. Reaching back to 1919, for instance, will be Paul Cowan’s 2008 doc Paris 1919, winner of the Gemini and Banff awards for best historical documentary. Jump forward 50 years and we’ll show you on Friday, April 12 one of the most celebrated documentaries of all time, Woodstock, Michael Wadleigh’s 1970, three-hour, warts-and-all film on the 1969 Woodstock Music & Art Festival in Bethel, NY. Each film is rooted in hope, with a subtext of identity, and perhaps, of conflict stemming from identity. 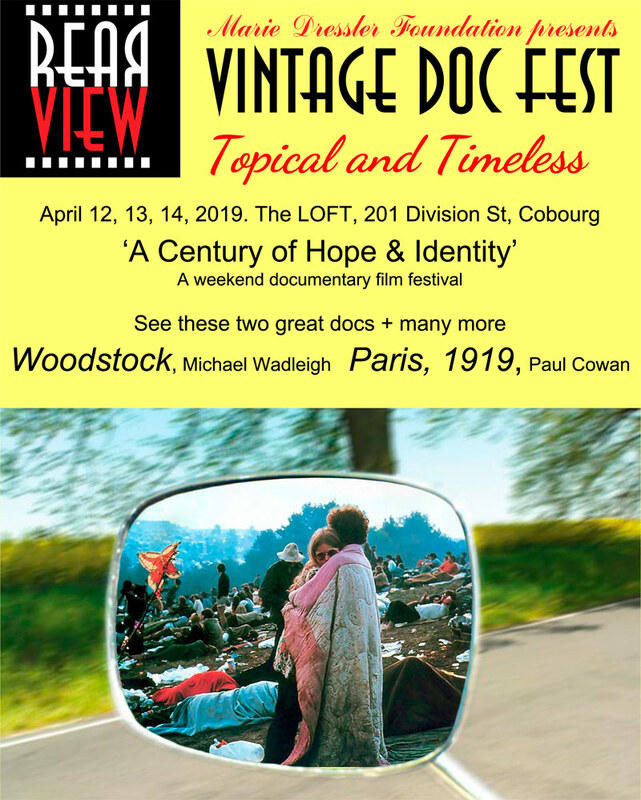 Maybe you should bookmark this page and return to keep up-to-date on our plans for the April 12-14, 2019 ReaRView Vintage DocFest. There’s a hard-working committee putting together the best topical and timeless documentaries to show you today through yesterday’s lens.